The Department of Health and Human Services has proposed a new rule that treats religious freedom as a license to discriminate and harm. The proposed rule puts patients last when it comes to health care, and goes against the very purpose of the department itself. It could enable – and even encourage – discrimination against women, LGBT people, people living with HIV, and others seeking critical care. The proposed rule is part of a clear agenda to use religion to justify harming patients. 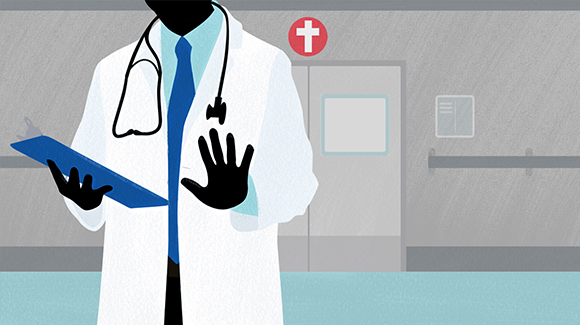 What does it look like when doctors turn away patients? It looks like Tamesha Means, who suffered unnecessary pain and infection when a Catholic hospital turned her away multiple times as she miscarried. The hospital didn’t even tell her that the fetus had almost no chance of survival and that terminating the pregnancy would be her safest option. Or Mindy Swank, who was similarly denied care when a Catholic hospital refused to help her end her pregnancy – despite the fact that continuing her pregnancy would endanger her life. The hospital also withheld documentation she needed to seek care elsewhere. Mindy was forced to spend weeks in excruciating pain until she gave birth to a baby who never gained consciousness. Ari Robbins, a transgender man from Washington, was refused necessary gender-confirming surgery by a health care clinic simply because of who he is. "It hurt me deeply and disrupted my entire life," said Ari. "No one should be turned away from the health care they need." We’ve already seen the harm done when institutions and individuals are allowed to disregard patients’ needs. With the Trump administration’s new proposed rule, more patients could suffer. That’s unacceptable. Submit your public comment now and let the Department of Health and Human Services know it should do its job of providing health care – not encouraging providers to turn people away. I am writing in strong opposition to your proposed rule entitled "Protecting Statutory Conscience Rights in Health Care; Delegations of Authority." Religious liberty is a core right that protects everyone’s beliefs. It does not mean the right to discriminate and to harm – but that is precisely what this cruel and dangerous proposed rule is intended to do. Because the proposed rule harms patient health and encourages discrimination against patients, it should be rejected in full and withdrawn. Reject and withdraw the proposed religious refusals rule. Your proposed rule values religious and moral beliefs over patient protections – and encourages discrimination.